Human-forced warming of the global climate system is pushing sea surface temperatures in some areas to a maximum of 33 C. Extreme ocean warming that is increasing the amount of latent heat the atmosphere can deliver to human bodies during heatwaves. And near a 33 C sea surface hot zone, the past few days have witnessed extreme heat and related tragic mass casualties in Sindh, Pakistan. For Pakistan, the heat and humidity has been deadly. Temperatures over Southeastern Pakistan hit 100 to 113 Fahrenheit (40 to 45 degrees Celsius) during recent days. Night time lows dipped only into the 80s and 90s (30s Celsius). Relative humidity throughout this period has remained above a brutal 50% even during the hottest hours of the day. Wet bulb temperatures (the wet-bulb temperature is the temperature air has if it is cooled to saturation — 100% relative humidity — by evaporation) climbed into a dangerous range of 30 to 33 degrees Celsius. This greatly reduced the ability of evaporation at skin level to cool the bodies of human beings exposed to such oppressive temperatures. As a result, people working outdoors, the elderly, or those without access to climate-controlled environments fell under severe risk of heat related injuries. According to reports from Al Jazzera, thousands of heat injuries and hundreds of deaths have occurred across the region since Saturday. Karachi’s largest hospital — Jinnah Postgraduate Medical Centre (JPMC) — has been flooded with over 5,000 patients suffering from heat injuries since the weekend. At some points, the hospital was receiving one heat injury patient per minute — a pace that nearly overwhelmed the facility. By earlier today, more than 380 of those patients had died. Across Sindh, Pakistan the story was much the same with the total official heat death toll now standing at 775 and climbing as calls were raised for more government support for people impacted by the worst heat wave to hit Pakistan in at least 15 years. 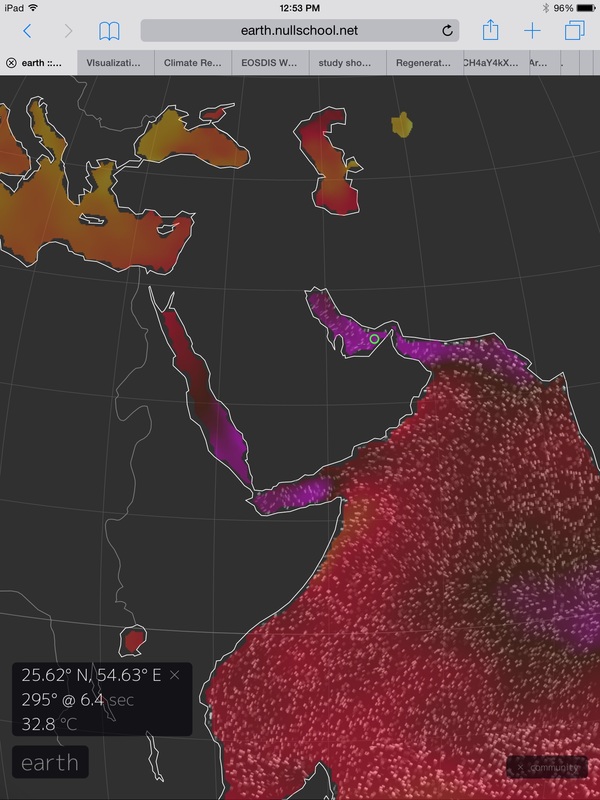 This extreme and deadly heat is a feature of a boundary zone between a hot, high-pressure air mass over the Persian Gulf region abutting against a very moist and El Nino-intensified monsoonal system over India. The result is a combination of high heat and high humidity — factors that, together, are very hard on the human body (wet bulb temperatures above 30 C are considered dangerous, while a blanket measure of 35 C [never reached yet on Earth] is considered rapidly deadly even in the shade). During late May and early June, similar conditions resulted in hundreds of heat related deaths in India. When the heat finally abated, the subsequent influx of monsoonal moisture set off torrential downpours. In some places, rates of rainfall exceeded typical June monsoonal accumulations by nearly 50 percent with Mumbai already having received 32 inches of rainfall (normal June rainfall is 23 inches). With Mumbai showing daily rainfall accumulations of 1-3 inches, it is possible that June totals could be double that of a typical year. The high heat, high humidity and related extreme rainfall events are all features of a warming world. At issue, primarily, is the impact of human forced global warming on the ocean system and how this heating then impacts the atmosphere — making it harder for humans to remain alive outdoors during the most extreme heating events even as it pushes a tendency for more and more extreme droughts and deluges. This warming related heat and moisture flux is most visible out in the Pacific, where record global atmospheric and ocean heat is pushing maximum sea surface temperatures into the lower 30s (typically between 30 and 31 degrees Celsius). These high sea surface temperatures in a record warm world are now dumping an extreme amount of moisture into the atmosphere through an El Nino amplified evaporation rate. A subsequent amplification of the equatorial storm track due to extreme moisture loading has already seen extraordinary record rainfall events in places as widespread as India, China and the Central U.S. Maximum global sea surface temperature is a good proxy measure for how much moisture the atmosphere can hold, a measure that also likely determines the maximum wet bulb temperature (implied latent heat) at any given point on the globe. And particularly, near Pakistan, we find ocean surface temperature readings in the range of 30 to 33 C running through the coastal zone of the Indian Ocean and on into the Persian Gulf. Readings that increased the amount of moisture the atmosphere could hold at high temperature, increased relative humidity readings as temperatures entered the 100s Fahrenheit (40s C), and forced wet bulb temperatures into deadly ranges which in turn reduced the ability of the human body to cool by evaporation at skin level. This is how human-forced global warming kills with direct heat — by basically increasing latent heat to the point that evaporation can no longer cool the human body to a natural maintenance temperature of 98.6 (F) or 37 (C). And once wet bulb temperatures start hitting 35 C, then the heat casualty potential really starts to get bad — essentially rendering heat wave regions temporarily uninhabitable for human life outdoors. With maximum sea surface temperatures now running near 33 C, we’re probably just within about 2 C of hitting that deadly boundary. The Pakistan and Indian heat deaths this year, though extraordinarily tragic and probably preventable without current level of human forced warming of the atmosphere, serve as a warning. Keep warming the globe through fossil fuel emissions and there are many far, far worse heatwaves to come. Large fires break out over Siberia during renewed Arctic heat wave. Over the past week, temperatures have been building throughout Central Siberia. A broad swath of heat pushed thermometers into the upper 70s to upper 80s (with isolated spots showing 90+ degree readings, Fahrenheit) in a broad region stretching from Siberia’s forests all the way to the Arctic Coast. These heatwave conditions set off more than a score of large fires that raged through both Arctic forest and across broad areas of tundra. The largest of these fires covered areas up to 1000 square miles and numerous smoke plumes were visible from satellite, some of which stretched more than 800 miles in length. A larger pall of smoke from this region covered areas of North-Central Russia, the Arctic Coast and sections of Europe more than 2,000 miles away. You can view these fires and related smoke plumes in the NASA Aqua Satellite image provided by Lance-Modis above. The scorching Arctic heat wave and massive burning has been set off, once again, by a high amplitude northward bulge in the polar Jet Stream and related ‘heat dome’ high pressure system resting just beneath the bulge. As you can see in the below image, provided by the California Regional Weather Service, this particular heat bulge extends past the 80 degree North Latitude line, nearly reaching the North Pole. This extraordinary upward sweep in the Jet has completely compromised the polar vortex, allowing hot air to build far north and pass deep into the Arctic Ocean environs. Arctic coastal temperatures usually average less than 50 degrees Fahrenheit at this time of year, but the region beneath this Arctic heat dome has averaged about 15-20 degrees hotter over the past week. Further south, where the tundra fields and arboreal forests of Siberia lay, temperatures have been even warmer with highs stretching into the middle and upper 80s and even lower 90s in some isolated locations. The added heat and the occasional thunderstorm that will typically form under such highly unusual Arctic conditions enhances the chance of wildfires. Now, after a week of such conditions, more than a score of large fires rage. Tuesday daytime temperatures for Siberia. Red indicates temperatures ranging from 77-86 degrees Fahrenheit. Note the broad swath of these temperatures riding up from Russia all the way to the Arctic coastline. These measures represent daytime temperatures at the point recorded and do not necessarily record daily maximum temperatures for a given location. Unfortunately, forecasts call for hot conditions to persist over this region of the Arctic at least until Saturday. Then, the heat dome and related Jet Stream bulge is predicted to slowly shift toward Europe, bringing heat, dryness and related risk of wildfires along with it. This particular heat wave is the most recent of many to plague the Arctic during 2013. Large Arctic regions from Siberia, to Europe, to Canada to Alaska experienced periods of extreme heat where temperatures rose 10, 15, 20 degrees or more (Fahrenheit) above average. The added heat and evaporation in one region appeared to aid in the formation of record floods in another with both Europe and Canada experiencing some of their worst floods on record. Strange changes to the Jet Stream and the water cycle driving these extreme events are directly related to human-caused global warming. In the first instance, human-caused warming has set off a series of events that have caused a major erosion of Northern Hemisphere sea ice. Since 1979, more about 50% of sea ice extent and 80% of sea ice volume has been lost. Since the 1900s, more than 60% of sea ice extent has melted away. The sea ice, which tends to lock cold air in the Arctic, is thus dramatically weakened. The result is that more warm air tends to pool in the Arctic. As this happens, the temperature difference between the North Pole and temperate regions lessens. This loss of differential causes the Jet Stream to slow down. As the Jet Stream slows, it tends to move more like a lazy river, creating big loops, large high amplitude waves and numerous cut off flows. The net result is that weather systems move more slowly, causing weather patterns to persist over longer periods. The high amplitude waves that have tended to form in the Jet Stream also result in warmer air being transported toward the North Polar region. In the case of the current Siberian heatwave and wildfires, this is exactly what is happening. What we have seen, this summer, is a ring of very hot conditions developing in the higher Latitude regions from about 60 degrees North to about 80 degrees North. This is the zone where much of the extreme Arctic heating has emerged. This second factor, added atmospheric heat, causes greater evaporation to occur, especially in regions where the heat is most intense. On average, the global hydrological cycle, which is the net rate at which water evaporates and then comes back to the Earth in some form of precipitation, increases its intensity by 8% for each degree Celsius of warming. Currently, average global temperatures are about .8 degrees Celsius hotter than the 1880s average. So the rate at which water evaporates and the rate at which it falls from the skies as rain and snow has increased by more than 6%. In the hot regions under the Jet Stream bulges and related heat dome high pressure systems this means far more intense soil drying and risk of wildfires. In the wet regions of cut off lows and down-slopes in the polar Jet Stream this means more intense rainfall events. In essence, this is how human caused global warming is helping to drive extreme weather events now. And the current Siberian heatwave and related wildfires is just one case in point. 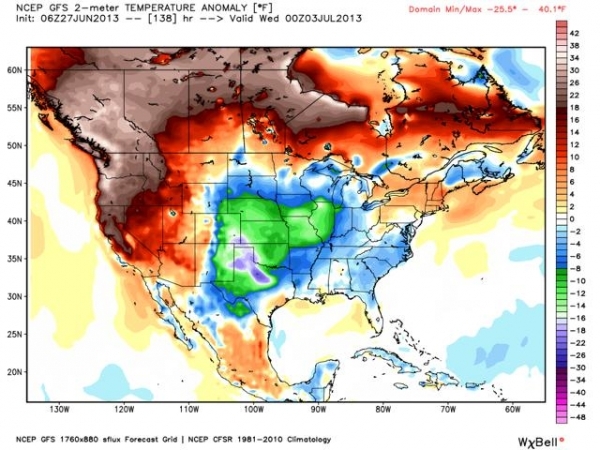 String of Deadly Wildfires Ignited By Record Heat Wave, Extreme Jet Stream over US Southwest. This Sunday, Death Valley hit a new all-time June record high temperature of 129 degrees Fahrenheit. It was the most recent high mark in a record-shattering heat-wave that baked the western US over the weekend, pushed power grids to the limits, resulted in numerous heat injuries and one death, and sparked multiple dangerous and deadly wildfires. Though the forecast is for high temperatures to slightly abate over the coming days, the long-range outlook is for heat to return with a vengeance by about July 11th. Overall, temperatures are expected to drop from the 110s and 120s into the still excessive, 100s and 110s, then jump back toward record-setting levels. A large, high amplitude blocking pattern and associated heat dome high pressure system is expected to persist. So conditions remain for temperature spikes as July progresses. With no long-range changes in this Jet Stream configuration expected, the Southwest will stay under the gun for record heat and dryness probably at least until the end of summer. So this initial volley of record heat can best be described as the first in a very vicious pattern of heat pulses which are likely to continue through the hot months of July, August and September. This extreme Jet Stream induced hot pattern is plainly visible in the latest ECMWF model runs. Here we see the record heat predicted for tomorrow with a broad area of 95 degree average 5,000 foot temperatures expected. Average temperatures of 95 degrees at the 5,000 foot level can often result in 110 or greater daytime high temperatures at the surface. As noted above, these very hot temperatures are expected to fade somewhat over the coming week before rising again toward record highs by around July 11th. This heat wave is just the crowning blow in a long string of warm, dry weather that has settled over the US Southwest since early 2012. The extraordinarily long duration heat and drought is the direct result of a near-permanent blocking pattern. A high amplitude wave in the Jet Stream and associated blocking high pressure have kept heat and drought conditions continuously in place. Such a stationary pattern is not normal and is brought about by a loss of sea ice and snow cover over the Arctic which is a direct result of human-caused climate change. These changes have both slowed down the Jet Stream and made weather patterns more persistent. Beneath the up-slope of these large blocking patterns heat waves, droughts and fires become a near-constant hazard. In the troughs, cooler and much stormier conditions predominate. In the west, fears were that, eventually, massive and damaging wildfires would result from the epic heat and drought. At first, it appeared that Colorado would be ground zero for this year’s fire season. There, multiple blazes devoured tens of thousands of acres and hundreds of homes. A single devastating fire, the Black Forest Fire, destroyed about 500 homes. Now, the current heatwave has set off numerous large blazes. Over the weekend and into Monday more than 20 massive fires sprang up throughout this drought and heat stricken region. As the worst of these fires bore down on Yarnell, Arizona, a team of 19 firefighters lost their lives while attempting to defend the town from the rapidly spreading blaze. A quick shift in the wind forced the firefighters to resort to the use of emergency shelters as the flames turned toward them. Sadly, only one of the team survived. The blaze quickly engulfed the town, destroying at least half of the 700 buildings there. So the long period of heat, drought and ever-expanding wildfires for the US Southwest, predicted by climate scientists and brought about by human caused global warming, appears to have started. Unfortunately, it only gets worse from here. Even with very aggressive reductions in greenhouse gas emissions, conditions will continue to worsen over the next few decades. Without a rapid reduction in greenhouse gas emissions, the drought which is now devastating the US Southwest will steadily expand north and eastwards until almost half of the United States is impacted. In Europe, the Sahara Desert eventually jumps into Spain, Italy, Greece and southern France and Germany. An expanding band of heat-bleached and eventually uninhabitable lands eventually engulf the equatorial regions and grow polewards. If we wish to slow and then stop the growth of these damaged zones, then we must stop emitting carbon into the atmosphere as soon as possible. Sadly, the most recent droughts, heatwaves, and wildfires in the US Southwest are just some of the milder first assaults of global warming. Things get worse from here. Far worse if we don’t drastically reduce carbon emissions. Mangled Jet Stream and Global Warming to Shatter Earth’s Highest Recorded Temperature This Week? The weather forecast for the American West is startling. An extreme blocking pattern that has persisted there since last year is now set to hit its highest amplitudes yet, allowing a massive heat dome to grow and sprawl out over the west for an extended period. The result will likely be a deadly heatwave that could send temperatures rocketing high enough to shatter Earth’s all-time record. This blast-furnace heat is forecast to begin this weekend with temperatures expected to reach 126 to 129 degrees (Fahrenheit) in Death Valley, California. This range is very close to the all time high record Earth temperature of 134 degrees. So even a minor intensification of this predicted heat wave could result in a new Earth temperature record. Other regions in the West are also predicted to experience record heat. Temperatures for both Phoenix and Las Vegas are expected to exceed 110 degrees (F) and could also shatter records for these two cities. The cause of this predicted record heat is a highly anomalous jet stream. ECMWF northern hemisphere temperature and pressure forecasts show the emergence of an above 30 degrees Celsius ‘heat dome’ forming at 5,000 feet over a large section of the American West. Temperature differentials on this map also outline the high amplitude wave pattern developing from the western US all the way up through Alberta, Canada. 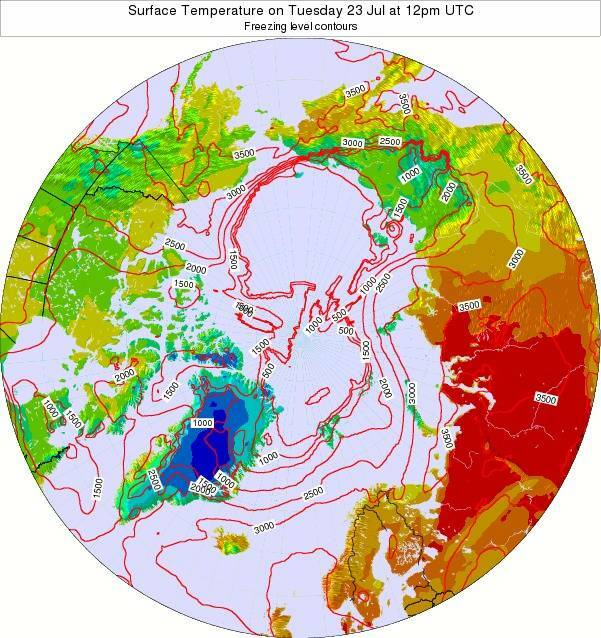 By Wednesday, July 3, this hot pulse has driven 15 degree Celsius (60 degree Fahrenheit) 5,000 foot temperatures all the way to the Arctic Ocean. Such a hot air invasion, should it emerge as predicted, could result in daily surface highs near 80 degrees directly adjacent to a region of the high Arctic even as 110, 120, or perhaps 130 degree temperatures bake Las Vegas, Pheonix, and Death Valley. Dramatic and dangerous alterations to the Northern Hemisphere Jet Stream are a result of a combination of sea ice loss and loss of snow cover of in the extreme north during spring and summer months. During May of 2013, both snow cover and Arctic sea ice volume were the third lowest levels ever recorded. As sea ice and snow cover erode, it allows more warm air invasions into the Arctic the result is an increased waviness and slowing down of the Jet Stream. Under the up-swell of these large waves, dangerous heat and dryness become more common events. In the path of the down-slope, we can expect to see increased cloudy, cooler, stormy conditions. So even as the American West bakes under temperatures that could, at their core, be the highest values ever recorded on Earth, the East and Central US are setting up for a dangerously unstable condition that may generate extraordinarily powerful storms. The heightening wave in the Jet will dig deep into the Arctic, tapping cooler air and instability before it makes a powerful dive into the moisture and heat laiden region from Minnesota, Iowa and Arkansas eastward. Powerful thunderstorms, hail, flooding, tornadoes, and in the case where streams of the down-rushing Jet converge, derechos are all possibilities given this powerful and unstable north-south flow. Very dangerous and unstable weather from a damaged and increasingly riled climate. We should do well to not only implement a rational Climate Action Plan, but to add a number of goals and increased efforts. We’re living in the age of consequences and each year of delay begs for more dangerous conditions. It’s your typical abnormal summer day in the Arctic. The Arctic heatwave flares again, Canada tries to recover from violent record floods, and a Persistent Arctic Cyclone that began in late May is continuing to core a hole through the sea ice near the North Pole. An Arctic heatwave that has skipped from Scandinavia to Alaska to Central Siberia, pushing temperatures in this polar region into the 80s and 90s (Fahrenheit), has now re-emerged to plague Eastern Europe. Temperatures in the middle 80s are once again emerging in Finland, an area that blazed with anomalous 80 degree temperatures in early June. But areas north of the Arctic Circle in nearby Russia are, this time, receiving the real baking. There, highs in the region of Archangel, near the Arctic Ocean, reached 92 degrees Fahrenheit. Out over the Kara Sea, just north of these record-hot conditions, an area still choked with sea ice experienced near 70 degree temperatures today. Average temperatures for most of these regions range from the 40s to the 60s. So current conditions are about 20 to, in some cases, nearly 30 degrees above average. In the above weather map, provided by Uni Koeln, we can see today’s record high temperatures showing up in pink in the lower right-hand corner of the map. Note the instances of 32 and even 34 degree Celsius temperatures (which converts to 90 and 92 degrees Fahrenheit respectively). 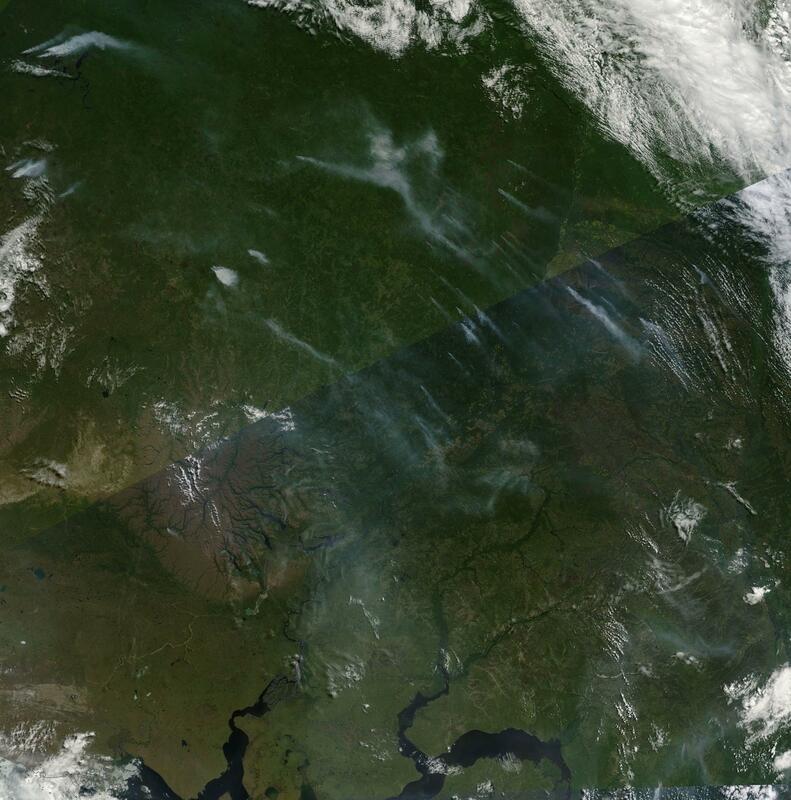 We can also see that some of last week’s fires over Siberia, which I described here, have been put out by a massive rainstorm now dousing the region. The storm emerged as a trough surged down from the Arctic and over Siberia, setting off large storms. During the middle of last week, the convergence of two upper-level flows of the Jet Stream set off very unstable conditions over Alberta, Canada. A cut-off upper level low stalled, trapped beneath a long-period blocking pattern and dumped rain on Alberta and regions of Central Canada from Wednesday through Monday. Consistent moderate-to-heavy rainfall fell in some areas for up to 16 hours without stop. By the weekend, many places had set one day records as a swath of 2 to 7 inch rainfall blanketed a broad region. Many areas, including Calgary, received their highest rainfall totals ever recorded. Contributing to the problem was hard, frozen ground and ongoing mountain melt filling up streams and rivers. This combination of impenetrable ground, snow melt, and ongoing, record rainfall resulted in massive floods that turned streams into torrents, roads into rapids, and stadiums into lakes. In total, more than 100,000 people were forced to abandon their homes. This particular event is likely to see damages well in excess of 1 billion dollars and could rival the record 22 billion dollar floods that rocked Europe just last month. Jeff Masters, at WeatherUnderGround, speculates that the 2013 Canadian floods may be the most costly in that country’s history. Given the massive impact of this major flood, damage totals may exceed previous record flood impacts, at around 800 million, by well more than an order of magnitude. 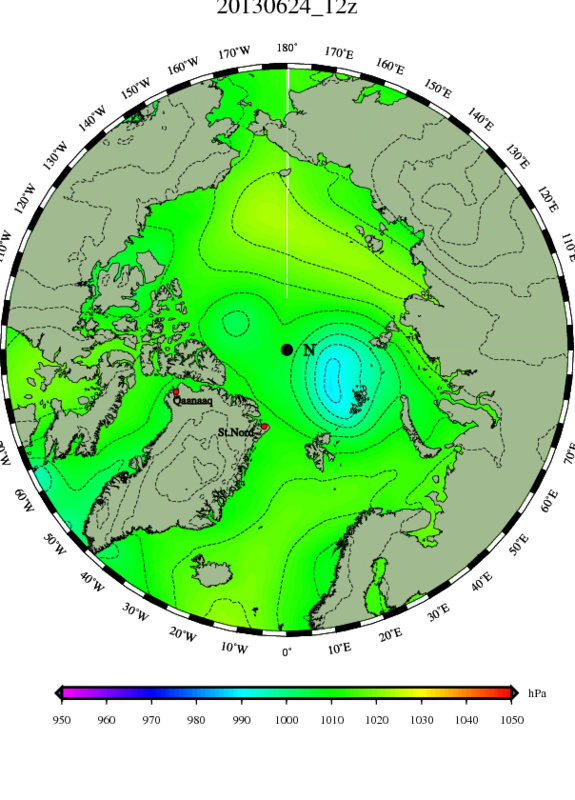 Lastly, a Persistent Arctic Cyclone that began in late May, and has now composed numerous storms remaining in place over the Central Arctic for about a month, continues to cut a hole into the sea ice near the North Pole. The above image, provided by DMI, shows PAC composed of an old low near the Canadian Archipelago and a new, stronger low that just entered the Central Arctic. Lowest pressures are now about 990 mb, which is somewhat stronger than the storm that lingered over the Arctic this weekend. Impacts to central sea ice appear to be ongoing even as somewhat rapid edge melt continues. The latest model assessment and forecast from the US Navy shows a widening and thinning area of broken ice near the North Pole, one that displays much greater losses than those seen earlier in the month. A band of open or nearly open water has now emerged just on the Russian side of the 180 degree East line. As you can see, model forecasts show this area of open water continuing to widen over this coming week. Meanwhile, some of the thickest sea ice is also showing the corrosive impacts of these ongoing storms. In the image above, you can clearly see the invasion of ice thinner than 2 meters where 2.5, 3, and 3.5 meter ice previously dominated. In fact, in later sequences, it appears that a knife of much thinner ice begins to drive down through the relatively small pack of remaining thick ice. The Central Arctic is extraordinarily cloudy today. So it is not possible to verify these Navy observations with visual shots. That said, the Navy projections have been both consistent and confirmed in the other monitors since early-to-mid June. Any one of these extreme weather events — a heatwave in Arctic Europe, immense floods never before seen in Canada, and an anomalous storm coring through the thickest sea ice — would be evidence that human caused climate change has radically altered the weather. Instead, we have all three occurring over the span of as many days. It is a pace of extreme events that is both troubling and astounding. And each has been affected by the sea ice loss, ocean, ice sheet, and atmospheric warming, loss of summer snow cover, and extreme changes to the circum-polar Jet Stream brought about by human caused climate change. We are in the age of extreme weather brought on by our fossil fuel use. If we are to have any hope of preventing the very worst impacts, we need to drastically begin reducing CO2 and related greenhouse gas emissions as soon as possible. More than half of the United States has been declared a disaster area due to an ongoing record drought. Currently, 1584 counties, 50.3% of all counties in the US, are drought disaster areas. 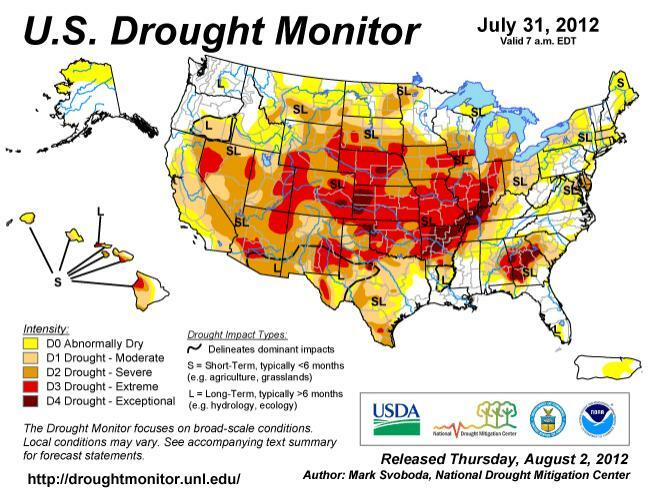 Over much of July, record heat and dryness resulted in expanding and continuing drought conditions for much of the US. These record conditions are severely impacting the nation’s agricultural industry. According to the US drought monitor, 37% of the US soybean crop and 48% of the US corn crop were rated in poor to very poor condition. Livestock has also experienced severe impacts with 66% of the nation’s hay and 73% of the nation’s cattle acreage experiencing drought. According to the US Drought Monitor, about 63% of the US landmass is currently undergoing drought conditions. For years, climate scientists have warned that human-caused global warming would result in intensified drought conditions for the US. With drought conditions occurring across wide swaths of the US for the past 7 years, it appears that this future is now. The current drought is one of the worst on record and threatens to intensify. It follows on the heels of a massive and debilitating drought in Texas last year. It is the second major drought to impact the southeast in five years. Unfortunately, weather forecasts show this drought is likely to continue through Halloween. If such an event materializes, the current severe impacts will grow far, far worse. Though it is normal for extreme droughts to occur over long time-scales, it is not normal that they occur with such frequency and such recurring severity. Most climate scientists now agree the current drought was made worse by climate change. A more clear statement is that the current drought is a product of human-caused climate change. What would have likely been a hot, dry period, has become an extreme event due the effects of added atmospheric heating. Stating this obvious fact should be something we encourage. It is impossible to deal with a problem unless it is first validated. But, considering our situation, it is only responsible to make a concerted call, not for panic, but for action. Strong changes to energy policy, major support for alternative fuels for transportation and electricity (wind, solar, biofuels, plug in hybrid electric vehicles and pure electric vehicles), a dedicated program of cut-backs for fossil fuel use (coal, oil, natural gas, tar sands), and national funding for climate emergency mitigation will be necessary to deal with this crisis. The goal will be to prevent future, worse disasters while working to mitigate the disasters that are currently under way. Given the current state of the world’s climate, without prevention and mitigation, we are likely to experience continued and worsening instances similar to this drought in the future. Regional and national droughts will continue to intensify, with more extreme events becoming more frequent and more intense. Even with prevention and mitigation, we can expect a period of difficulty, but with proper policy measures, these difficulties should be manageable. It is worth noting the amazing degree of short-sightedness business and political leaders pushing for expanded fossil fuel use express. This complete lack of responsibility and leadership in pursuit of short-term profit and political gain, if continued, will result in nothing short of the United States losing its position as an agricultural superpower. It will also have severe and devastating impacts on both national and world-wide food security. So let this be an appeal to these leaders — the oil barons, the coal barons, the gas barons, and the politicians who support them — the time for change is well past. You may continue your attempts at dominance and short-sighted profit, but you do so by waging a campaign of devastation and degradation on the rest of us. This is unconscionable. It must stop now. Please help support our continuing efforts.